Tapirs are big strong perrisodactyles (1-2m) and weigh up to 120-300kg. Adults are grey brown, new borns are dark brown with light stripes and spots. They have short legs and a trump-like nose. 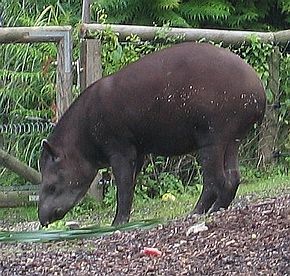 Tapirs are herbivors, they feed on leaves, water pkants, flowers, branches and fruit. They are solitary living.